Cats normally do not need help getting and staying clean. They are fastidious about their cleanliness and spend much of their day primping and preening. Cats learn from a very young age to stay clean, as the mother always teaches their young the art of bathing. Cat owners rarely need to give their cats a bath, however, there are some situations where you may find it is time to bath kitty. You never know when your cat will get so dirty that they need a little extra help. If your cat is afflicted with skin allergies or has a flea infestation, you might need to bathe your cat. Sick and older cats may have a difficult time keeping clean, too. You will find that your cat probably resists getting a bath, but you can do it if you are prepared. 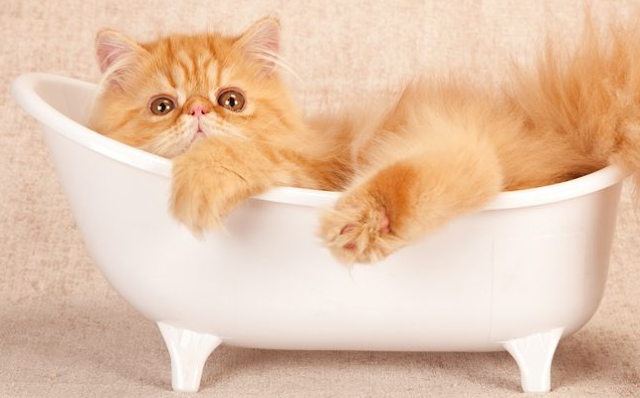 The best place to bath your cat is in a small, enclosed room. If you have a sink in your laundry room, that would work perfectly. A deep bathroom sink would also do the trick. The idea is to get your cat in a small area to help him or her feel safer during the process. Another idea is to use a baby tub and place it inside your own bathtub. This might cause an aching back on your part, but may be just the thing for your cat. In addition, you will want to make sure that you have everything you need on hand before you begin. It will be almost impossible to stop what you are doing with a struggling cat to run and get a towel or shampoo. You will need several old towels, mild, non-irritating shampoo such as baby shampoo or pet shampoo, and a cup for rinsing. You might even consider using a turkey-basting tool to reach under the chin, around the neck and between the legs. In addition, if your cat’s fur is matted, you might want to consider cutting these mats away before beginning. When you have gotten all of your supplies where you need them, you will want to prepare the bath. Your cat will not like very hot or very cold water, so lukewarm water works best. Think of the temperature you would use to bath an infant. That is what you need when you wash your cat. Next, fill up the tub or sink. You do not need a lot of water when you bath your cat--just enough to rinse the cat off. It is also a good idea to place a non-skid mat or folded bath towel in the bottom of the sink or tub before you begin filling it with water. This prevents the cat from slipping around on the bottom of the sink or tub. It is now time for the hard part. You have to get your cat and ease him or her into the water. This may sound easier than it is. Some cats may struggle with you more than others may. Only you know your cat’s personality. The best way to go about doing this is to lower your cat into the water. Do this by placing one hand under the cat’s belly and one hand firmly, but gently on the cat’s back. Lower the cat from its hind legs into the water. If your cat is still struggling, you might want to wrap a towel around your cat to prevent scratches. You might be surprised by your cat’s reaction. Some cats will sit there quietly and let you work. Others will be scared and will try to run from you. You will get wet, but you may think about holding the cat’s body close to your own while bathing so he or she feels more secure. Never raise your voice or move too fast, as this can send your cat into a frenzy. After your cat is somewhat situated in the water, you can begin to bathe. Work quickly, but gently. The best method for bathing your cat is to start with the head and work your way down. Be careful not to get water or shampoo in your cat’s ears or eyes. You will only need a very small amount of shampoo. If you get too much, you will have to rinse longer. If you are treating fleas, then you will want to follow the directions on the flea shampoo at this point. You can use vegetable oil if you need to remove sticky substances from your cat’s fur. Use this sparingly because this will leave an oil residue on your cat’s fur, although it is harmless. 0 Response to "Tips For Bathing Your Cat"